The rise of freemium or free-to-play apps has been dramatic over the last year, becoming the dominant revenue model for the top gaming titles in Apple’s App Store (s aapl). Mobile analytics and advertising company Flurry said in June, free-to-play games, which monetize through in-app purchases, now account for 65 percent of revenue among the top 100 games in the App Store, while paid downloads account for 35 percent of revenue. That’s a big reversal from January, when paid download revenue brought in 61 percent of revenue for the top 100 games. But it shows how developers have embraced the freemium model, and at least for the top publishers, they’re finding it more lucrative than charging for downloads. As I wrote about last October, one-third of the top 100 grossing apps were freemium, and by the end of 2010, Distimo reported 49 percent of the revenue on iPhone apps came from in-app purchases in both free and paid apps. Mobile games are following in the footsteps of social games, becoming games as a service that continues to be updated over time. The free-to-play model ensures a lot of users can try out a game for free, greatly expanding the number of potential users. But it comes down to extracting money from just a small fraction of them, selling them on virtual items, currency and goods that enhance the game play. Flurry said only 0.5 to 6 percent of gamers actually spend money in free games, depending on the quality of the game and its mechanics. That’s a small percentage, but it works for game developers who can build engaging titles that keep people coming back. That’s been the secret to companies like Pocket Gems and Playforge, which I’ve written about before. They focus on holding on to users for long periods of time through updates and features, which can pay off as they get users to eventually open up their wallets. As I noted earlier, the industry needs to value engagement more rather than pursue pure download numbers, because developers can’t monetize users who abandon a game after a couple of weeks. This isn’t to say free-to-play is the only way to make money. Paid downloads are still an important revenue source and won’t go away. I, for one, still like to pay for quality titles. And mobile advertising, while still just emerging, can also bring in dollars for big titles. 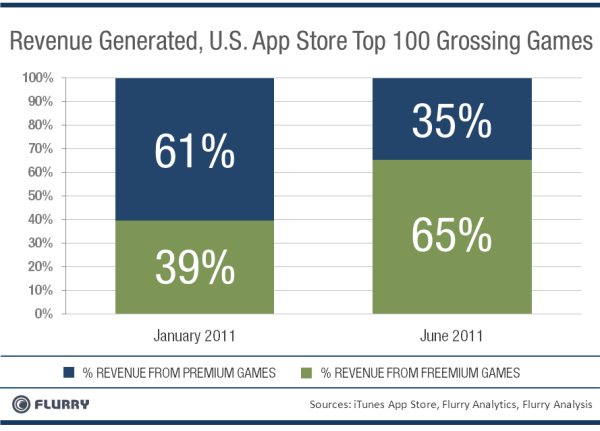 But the money in the mobile gaming market is clearly tilting toward freemium. Gartner (s it) estimates mobile gaming will be the fastest-growing gaming segment, accounting for 20 percent of the expected $112 billion in overall gaming revenue by 2015, fueled in part by the shift to free-to-play games. Developers need to figure out if this makes sense for their apps and how they can implement it well, because it’s not enough to just adopt this model. A lot of tinkering and tuning is necessary to make it really pay off. But when you get it right, it seems the dollars are increasingly there. Really useful post Ryan thanks. This hits it right on–“the industry needs to value engagement more rather than pursue pure download numbers”. I’ve been thinking for a while how the traditional traffic funnel has changed, getting both wider and deeper as engagement layers into other traditional traffic sources. While I agree, businesses, especially small to mid-sized ones are working to understand this change and use it to build businesses around. Big brands spend big dollars to get out ahead of the curve. Small businesses are playing catchup with a lot of these social changes.